Carrie Wray was the third child and first daughter of Alfred and Emily born in the late spring of 1886 in Preston. She featured a number of times in the school log book: 1895, ‘I publicly caned Caroline Ray for stealing three of the school’s lead pencils’; 23 April 1897, ‘Have sent Carry Wray’s name to the attendance officer as her mother has illegally removed her from school to plait at home. She is only eleven years of age’; 25 April 1898, ‘Caroline Wray has left to help her mother’. In 1901, Carrie was living and working at 21-3 Sun Street, Hitchin as a Domestic Servant. 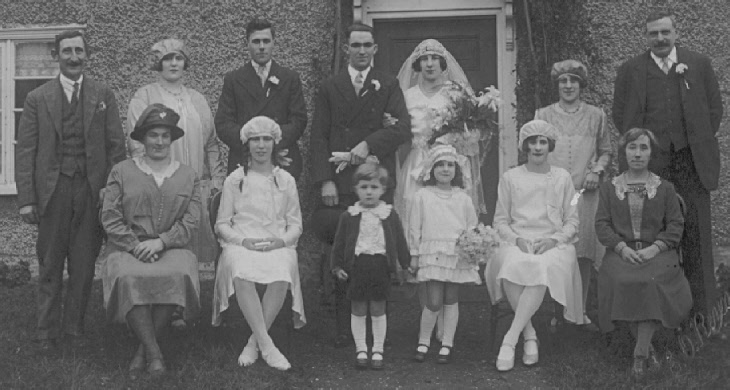 In 1911, she was a domestic servant at Joseph and Ann Pell’s farm, Wilden, Bedfordshire. In 1912 she was living at Back Lane, Preston. 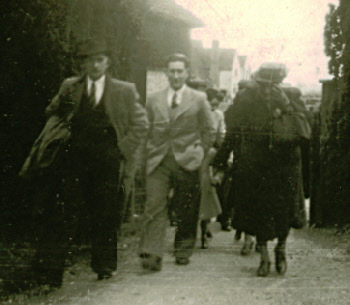 Carrie left the village on 19 February 1912 and married Jack Pell (who was from a long line of Bedfordshire farmers) in the spring of that year in Barnet. We next find Carrie living at Chequers Lane (presumably with her parents) from October-December 1916 before the family moved to Colesden, St Neots, Bedfordshire. Harold Pell’s wedding. Seated far left is Carrie and her husband Jack is standing behind her.